An oven used to fire pottery or limestone..
A sailing vessel of two or more masts, all fore-and-aft rigged. The Thomas W. Lawson, built in 1902, had seven masts. In comparison to a square-rigged vessel of comparable tonnage, a schooner is better for coastwise sailing.. Over half of Maine’s bricks were shipped south. 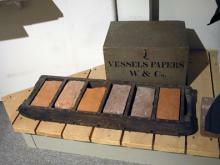 Growth of cities like Boston, as well as mid-century fires resulted in rising demand for brick. Locally, fires ravaged Rockland and Camden, whose commercial sections were rebuilt in brick. Brick became the fashion for other downtowns. Mainers were accustomed to using ice to keep food fresh, but it wasn’t until after the Civil War that shippers discovered how to transport ice to cities from Boston to Rio de Janeiro and as far away as India. Maine’s ice trade, centered on the Kennebec River, grew dramatically after a warm winter in 1860 ruined the ice harvest on the Hudson River, ice supplier to New York City. During the Civil War, the government needed ice for hospitals. From 1870 to 1890, there were only two years when Maine shipped less than 1 million tons of ice. A scratch or thin carved line incised in a surface so that later pieces break apart along this line. and cut with big ice saws. The blocks were then taken to an ice house for storage and insulated with sawdust. When spring and summer came, schooners carried the blocks in sawdust and sometimes with a load of hay to markets on the East Coast and beyond. While ice was cut in many places around Penobscot Bay, the largest operations were in Rockport, Rockland, Belfast, and Brewer.